I am always on the hunt for secret hiking trails and cool places to see when I go on a trip….or anywhere for that matter. I guess it comes with my slightly hermit-ish tendencies. Seriously though, secret hikes in National Parks are usually the hikes that I love the most! What makes a trail a secret you say?! Basically my rule is that if the trail is not listed on the maps or brochures that I receive at a visitor center or entrance station, or if it is really hard to find in a guide-book or online then it counts as a secret. 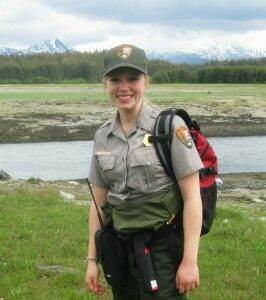 After all, 99% of people who go to National Parks will stick to the information that the rangers give to them. This waterfall is quite small, but it is absolutely stunning with crystal clear pools that reflect the red rock that surrounds it. The best part was that we had it all to ourselves. Swimming is allowed in the pools (they are surprisingly deep) but as it was February when we were there, the water was too chilly to swim in. If I would have been there in the middle of a Zion summer…hot, hot, hot…then swimming would have been a definite yes. *Disclaimer* Because this hike is along an unofficial trail that travels through an area prone to flash floods, the trail itself may be slightly different than described below. Floods can change the amount of obstacles you’ll encounter as you travel this trail! The trail is about 1 mile round trip. 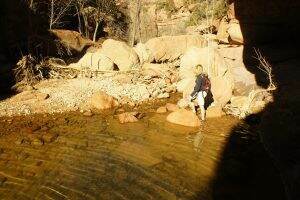 It does require some maneuvering around boulders as well as a short slickrock climb around the pools at the end. 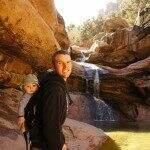 We were able to complete it with our child in the baby carrier without much of a problem. The nice thing is that the trail is less than a mile so if you get to the end and decide not to climb on the slickrock, it’s not that big of a deal. The hike itself is really pretty because it follows the creek the whole way. As with all hikes in Zion National Park, prepare for sweltering temperatures and scarce shade. Be sure to take plenty of water and sunscreen, and don’t forget to check the flash flood warnings at the Visitor Center. FLASH FLOODS CAN KILL. This is not something to take lightly so check the warnings before you go! This hike is definitely subject to flash flooding. We saw a few downed trees and markings on the walls where the water level has been. From the Springdale/South Entrance of Zion National Park, follow the road for about 1.5 miles to the Canyon Junction. At the junction, take a right toward the Zion – Mt. Carmel Highway. The road will be straight for a moment, and then it will start to make a U-Curve up the mountain. At the beginning of this U-Curve there is a dirt pullout with a small sign. This is the trail to the Pine Creek Waterfall. Heading to Zion National Park? Click NEXT to see my list of 10 Things You Can’t Miss on Your First Visit! What is your favorite hike in a National Park? Now I really want to go back to Zion again! haha. Wish I’d seen this post a few months ago, looks like a cool hike. Zion’s such a great park though and I’ve no doubt we’ll be back again some day. For now, I’ll just have to add this to my ‘to hike’ list! Just an excuse to go back! Happy hiking! We went last week with my inlaws (59&65) DH, myself and our 3 and 1 yr olds (1yrold in a carrier on my back). This hike is definitely more well known and the trail is very apparent from the road. I’m guessing there’s been more rockfalls (and some small rocks fell near us while we were at the bottom, heads up!). The trail was pretty rough and trailfinding became difficult. We were all able to make it but we had to assist eachother quite a bit and ask bystanders for assistance as well. (Including a group of skinny dipping college girls we came across). .? There were several spots we had to climb and crawl over boulders and rocks and even one large boulder blocking a passage to the pool that youhave to climb over and squeeze through the whole. The boulder was up to my neck in height. So this trail is a bit more difficult to access now and if you want to do it, be prepared to climb, crawl, scramble, etc to get through. We all really enjoyed the waterfall and pool. The hike and 20 minutes at the waterfall took us about 1.5 hours. We saw about 8 different parties along the route most were pairs, the skinny dippers were a group of 6. Yeah I think the word is getting out on this one…and that’s too bad about the rockfall and skinny dippers. I’ll have to go back next time I’m in Zion and check it out. Thanks for the heads up!! If I were to go in the shuttle was stop would I have to get off on? Hi Lluvia, you’d want to get off at Canyon Junction and then walk along the Zion-Mt. Carmel Highway to get to the trailhead. Would the “slickrock” area possibly be doable for kid hikers age 10 & 12 (or me, their mom who is a bit afraid of heights?) If someone was to slip would it be a dangerous area? Also, is this a hike something you can get do during the peak session when cars are not allowed in parts of the park? We are so excited for our trip to Zion! Thanks for your help!! The slickrock is not very high or scary…it’s maybe 4 or 5 feet to get up to the ledge. I think you and your kids would be just fine (you may have to boost each other up)! The trail is so short that if you get to that point and don’t feel comfortable, you could just turn around and be back to your car in 10 minutes so it doesn’t hurt to try. This hike isn’t in the section of the park that is off-limits to vehicles so you can drive right to it. Have a great time! Love this! I like hidden gems too, and I’m so glad you are willing to share. Flash floods SCARE ME! I just finished a post on the warnings signs, because like you said — they can kill. I think people don’t realize the danger. Have fun!! And thanks for always being willing to share the hidden gems. 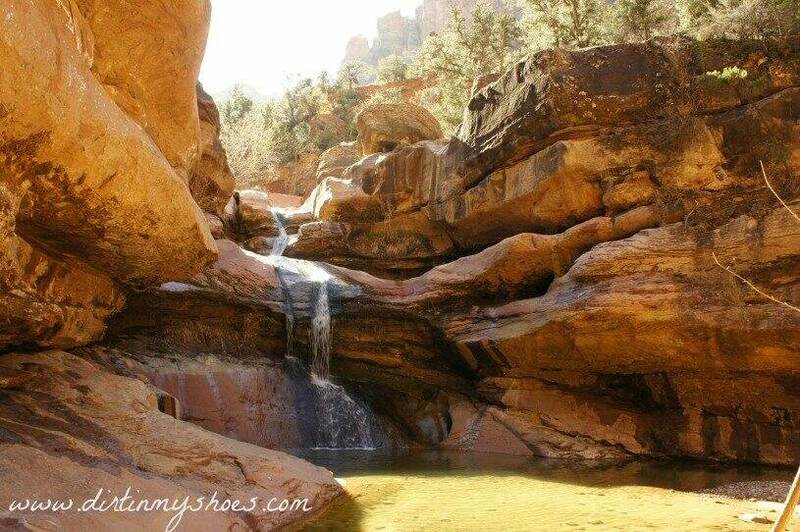 My favorite secret family friendly hike in Zion so far is Many Pools which is on the east side of the 2 tunnels just further up the road from pine creek! 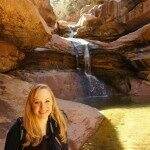 🙂 My favorite time of year to hike in Zion is spring, just as it is starting to warm up and the snow is melting and runoff is creating waterfalls everywhere! So beautiful! Thanks for the awesome recommendation. I will let you know when I head back down that direction. And I have to agree about spring in Zion. It’s not too hot, and not quite as busy! What a find! This is absolutely beautiful. Zion has officially been added to the bucket list. Thank you for sharing this with us! Thanks Brittany! I hope you are able to visit sometime soon. looks like such a lovely hike!! getting to a waterfall is always so rewarding, right? 🙂 we hope to go back to zion soon! Hiking to any sort of water is always at the top of my list! You should try this one….we loved it! Hiking in Zion is on my bucket list! Sounds beautiful! It is a great place to put on your bucket list. Let me know when you take the trip! omg that place looks amazing. I would love to go there. Jasmine, it is amazing! You need to take a road trip through the Utah National Parks sometime soon. This place looks amazing, so beautiful! A fair way from me (a long plane trip at the least!) but one to add to the list. I think I’d be a little worried that I’d get lost… so tracks for me! It is so beautiful! I hope you can make it to Zion. You will love it!